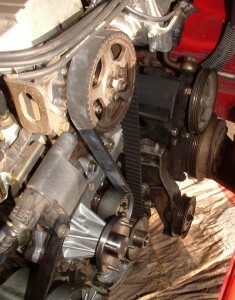 In most cars manufactured today, the timing belt (cam belt) controls the opening and closing (timing) of the internal combustion engine’s valves. Previously, cars were manufactured with timing chains, and some still use chains today. Additionally, there are some automobile engines (VW Flat-4 Air Cooled, Toyota Straight-6 F Engine) that use gears to establish proper synchronization of valve timing. The crankshaft is connected to the camshaft(s) to control the opening and closing of the engine’s valves. With a four-stroke engine, the valves are timed to open on every second revolution of the crankshaft. This is achieved with the timing belt. Each engine has a timing belt designed for its specific operation. The teeth in the belt are designed to synchronize the rotation of the camshaft(s) to the crankshaft. Although timing chains or gears are more durable than timing belts, they are also noisier when operating. Rubber composite belts are less expensive than gears or chains. Because the belt weighs less than the metallic counterpart, the engine may also prove more efficient as well. Although timing belts do not require lubrication, like chains and gears, they must be replaced at intervals as suggested by the manufacturer. When the timing belt fails, the valves remain open and will be hit by the pistons, causing serious damage to the engine. Often, you will be advised to replace other components at the same time as timing belt replacement (water pump, tensioner, etc.). The other components are situated such that the additional cost is negligible when the timing belt is being replace, and can prevent another expensive repair down the road. When a timing belt is replaced, it is crucial that the tension be correct. 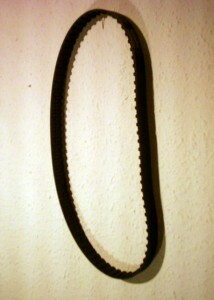 If the belt is too loose, it will “whip”, too tight will place excess tension on the belt, causing it to squeal or whine. Either case of improper tension will diminish the life of the belt. Generally, when you have a Everett Timing Belt Replacement the belt tensioner will be replace as well. Please note: if the failure is the tensioner or with the gear/idler bearings, the timing belt will de-rail. Today, timing belts are typically made of rubber with high tensile fibers (HTF) along the length of the belt; the HTFs are the tension member of the belt. High temperatures and oil, antifreeze and water will affect the integrity of the rubber and the HTF. Newer, more expensive, more resistant belts are made of Highly Saturated Nitrile (HSN). For a standard timing belt, precautions must be taken to avoid contact with degrading substances or conditions. Some manufacturers provide a protective cover for the timing belt that must be removed for inspection/replacement.